You know all the tired, traditional debt payoff strategies but they all mean you’re still paying thousands in interest over years of payments. By the end of this video, you’ll know how to use a debt consolidation loan to save money and cut years from your payments. In fact, I used this same process to save over $3,400 and pay off $15,000 in debt after destroying my credit in 2009. Today’s video is the fifth in our debt payoff series, an entire series on ditching your debt from creating those goals that are going to motivate you to some tricks I’ve learned to pay off debt. Think of it like a TV series, at the end of this season, you will have all the tools you need to finally get out from under that crushing debt. Make sure you subscribe so you don’t miss any of the episodes. I’ll also be putting these videos in a special list in the Playlists section of the channel so you can watch the series in order. Join the Community on Let's Talk Money! I love the two debt payoff strategies we saw in the previous video, two ways to pay off your debt that save thousands in interest and motivate you every step of the way. But there’s another way to pay off your debt that I wanted to keep for its own video. I used it to get my debt under control and save $3,400 in 2009. It helped increase my credit score and it will work for you but it’s sooo controversial. In fact, it’s probably the most controversial thing we’ll talk about in our debt payoff series. I’m talking about debt consolidation, taking out one large loan to pay off your high-interest credit cards and other debt. The average American has $15,000 in credit card debt at a rate of 18% – that means they’re paying about $225 a month in interest alone. Not only that but they also have $37,000 in other debt not including a mortgage. That’s student loans, car loans and other debt that cost another $300 a month in interest – that’s over $500 a month lost just on the interest or about $6,000 a year down the drain. After that, how much is left to actually pay down the debt? Zero, that’s how much. In 2009, I was bankrupt and owed tens of thousands in credit card debt and other loans. I was barely keeping up with the interest payments. I was able to get a personal loan for $15,000 to pay off credit cards and a car loan. The interest rate of 13% on the consolidation loan was well under the 18% I was paying on the debt so I was immediately saving $40 a month on payments. Not only did paying just one bill a month instead of three make it easier to manage but I still made the same monthly payment and ended up saving $3,453 in interest and paying the debt off almost a year early. But debt consolidation is controversial, I get it. Consolidation is like giving methadone to a heroin addict. You’re giving them one drug to get them off another and while methadone is much less addictive and dangerous, there are risks. It’s the same with debt consolidation. You’re getting a loan to pay off other debts. You’re going to save money on interest and make your finances more manageable but there are also risks. If you use the money from the personal loan just to go shopping instead of paying off your loans, or even worse yet, you pay off your credit cards but then max them out again, now you’ve got twice as much debt. 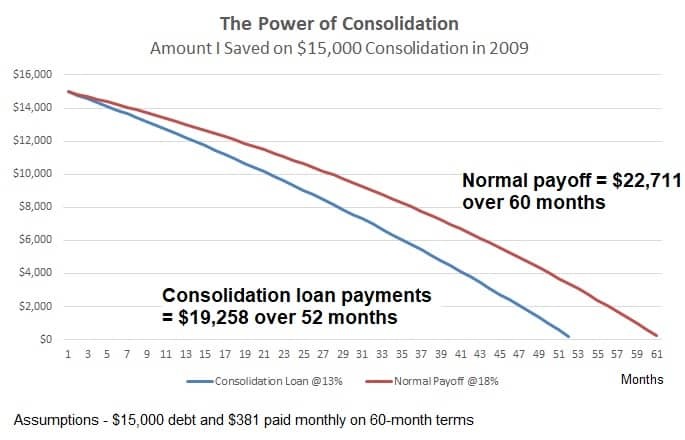 A consolidation loan is like getting a pet alligator to eat the pet snake that got too big and is roaming the house. Get the alligator, let it do its job…but then get rid of it fast. So that was a really long lead in but I just want to make sure you know the risks and how to use debt consolidation without falling deeper into debt. If you still want to take control of your debt, to save money and pay it off faster, I’m going to walk you through how to get the best rate possible on a personal loan. So how do you get a debt consolidation loan? I’m going to walk through the process on one of the personal loan sites I’ve used. An important thing to remember is to apply for a loan on at least a few sites to see which offers the best rate. The sites do a soft-pull of your credit so it won’t affect your score. I’ve got a comparison list of consolidation loan sites that you can use to find the best site for your credit score. Click through and check out a few of the sites because you really do want to shop around to get the best deal possible. Your first step is just to list out your debts, how much you owe and the interest rate on each. Make sure you get every single one on the list. This includes credit cards, car loans, personal loans, payday loans, everything plus the interest rate. This is going to be important because you might not want to consolidate all your debt. Usually your mortgage is at a pretty low rate so you won’t want to use another loan to pay it off. The idea here is that you’re going to be paying off high-rate debt with a lower-rate loan. Next, click through to one of the loan sites in the comparison list on the blog. 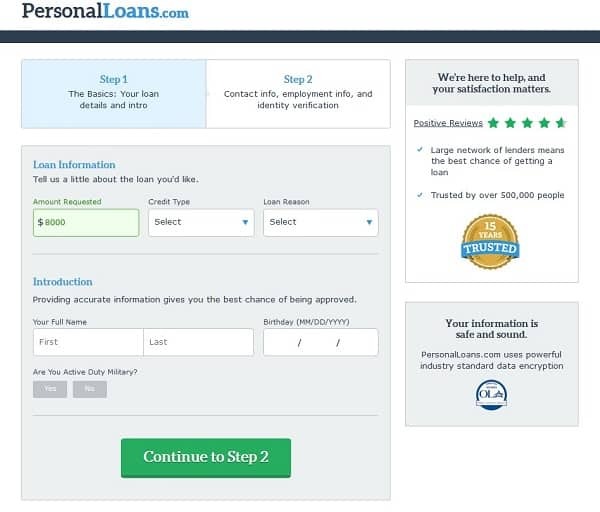 I’m going to use personalloans.com as a comparison because I’ve used them twice for loans. I used them first for a consolidation loan and then again for a loan to remodel our home. Depending on your credit score, you’ll qualify on some loan sites but not others so check out the list and shop around a little. Here we are on the personal loans website. I’ll go through the process but it’s really straight forward and takes less than five minutes. The first thing you’ll see is this slider for how much you want to borrow and the get started button. The amount doesn’t really matter right now, just put in your email and click to get started. The next screen is some basic information like your name and birth date to make sure you’re at least 18 years old. After this first step, you’ll be asked for contact information and verification to protect your identity. You’ll put in your address, employment information, a driver’s license and your social security number. Again, this is so the site can do a soft-pull of your credit. It’s like what happens when you get pre-approved for a loan. It allows them to set an interest rate but doesn’t hurt your credit score like a hard pull. Approval is instant and the website is going to come back with a quote for an interest rate. It will also show you the exact amount you’ll pay each month. No hidden fees here and there’s no cost to getting a loan, that’s why I like this site versus some others. Now if the rate on your loan is less than what you’re paying on some of your debts, then you’re going to be saving money. 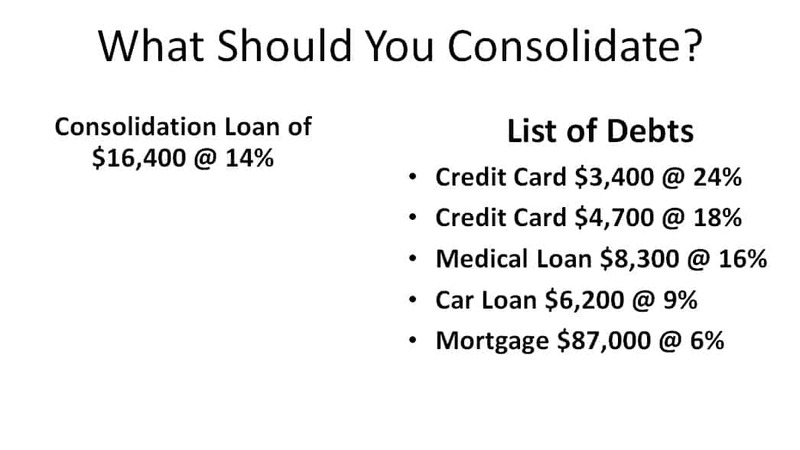 If you get a quote of 14% on your consolidation loan and you have three debts that charge interest of between 15% to 24% then paying those off will lower your monthly payment and save money. If you agree to the terms of the consolidation loan, you’ll link up your bank account and can usually receive your loan within a few days. Some people might be asked to email copies of their paycheck or to verify employment but it’s pretty rare. Your monthly payment on the new loan is on a fixed rate and the same every month, one of the great things about a personal loan versus credit cards. You’ll know exactly how much you owe every month and you’ll be on your way to paying the debt off. The payment will come directly out of your bank account each month and on the same day. 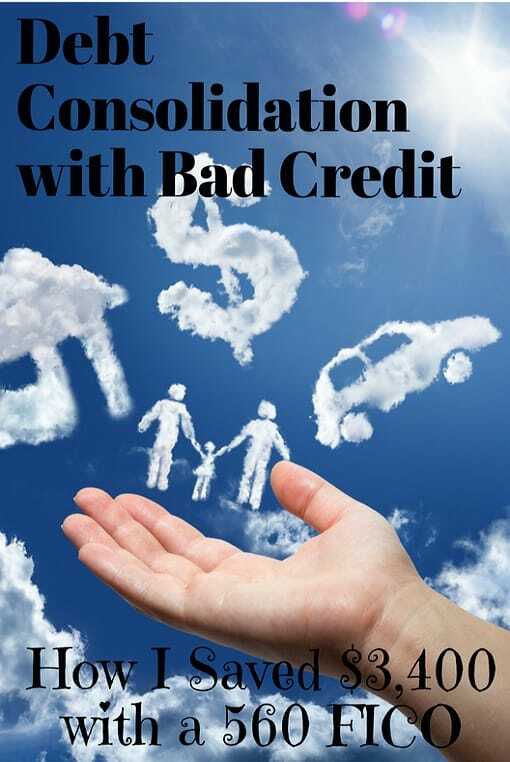 One of the hidden benefits of debt consolidation is that it goes on your credit report as a non-revolving debt. This means you have a payoff date and a fixed payment and is different from revolving debt like credit cards with payments that go up and down. The people that make your credit score hate that revolving credit card debt and it’s one of the things that really hurts your FICO score. I’ve seen people get a 30 or 40 point bump in their credit score by paying off their cards with a personal loan. Once you've used a debt consolidation loan to manage your debts easier and lower your rates, you can start working on your credit score. We’re going to be talking a lot about credit scores in our next few videos in the debt series. I’m going to show you exactly how to check your credit, how to boost your score and give you some hacks you can use to get the best rates on any loan.